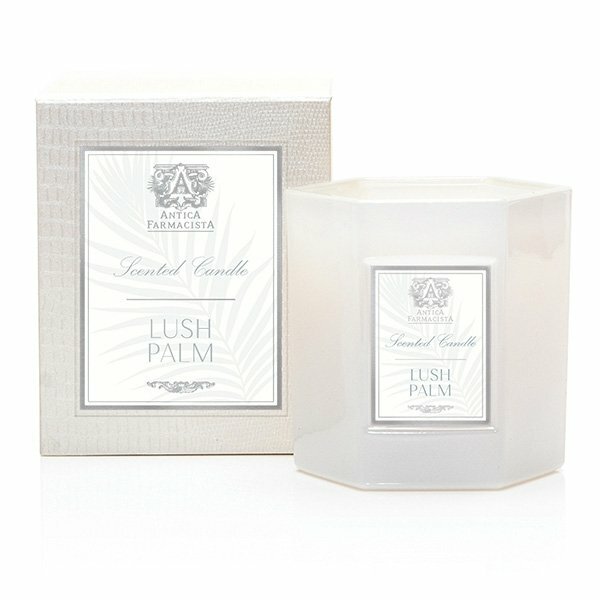 Antica Farmacista Lush Palm Candle is an intoxicating green floral fragrance. Reflective of the exquisite natural beauty that exists just beyond the sea. Escape to a warm pacific breeze wafting through beachside Tahitian gardenia, dewy banana leaf and wind swept palms. The signature soft white glass, now hexagonal in shape, is filled with a soy-paraffin wax blend, resulting in 60 hours of beautifully scented illumination. Packaged in a luxe hinged box, embellished with a pearlescent croc texture. Each decorative box includes a set of Antica's signature matches.